An essential tool for the realization of facials favoring the correct absorption of the applied products and conditioning the skin to obtain optimal results according to the type of treatment without the necessity of needles, like before technologies. For detoxification, lymphatic drainage, improve blood circulation. Electrical energy tends to follow the shortest distance between the two electrodes. When electricity runs through living tissue the high energy flow generates heat as a characteristic of the electrical energy and the resistance to electricity by the living tissue. 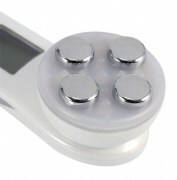 This is another feature of Dr. Arrivo that adapts electricity to be gentle on the skin. can effectively dilute the dark circles and bags under the eyes. Restrain excessive melanin production, and make the skin more white. Anti-inflammatory calm shrink pores, apply to acne or greasy skin. Carry bright color of skin, adapted to the spots and dark skin. Whitening the skin, suitable for skin darker skin. Strengthen the infiltration of hairdressing fluid or gels.